How Hard Can Membership Be? A month long blogging contest leading up to the release of WooCommerce 2.3 Handsome Hippo. This only takes a couple extra clicks and if you're the curious type you'll probably have discovered the setting all on your own. For those of you that missed it I'll break it down. Once you click the Schedule link two new fields will popup. The start date and end date. Don't forget to press the Update button and then view your product on the front end. If you're within the sale dates you'll see the discounted sale on the front end. The sale date is based on the time you have set for your site. That means that if someone is shopping in Bangkok which is 14 hours ahead of where I am (Denver) and it's still Thursday evening my time they won't see the sale. You can check the time zone set for your site under Settings > General > Timezone. Is the end date the day the price will return to normal, or will it still be on sale until that day is up? Hey Brandon – good question! The sale date is when the sale immediately ends. So if you want your sale to run from Thursday all the way through Monday then the sale end date should be Tuesday. Hi, my scheduled sales just doesn’t work. Do you have any clue why is it so or which setting should i check? There’s probably something wrong with wp-cron. That’s the technology behind scheduling things in WordPress. There have been some instances of plugins breaking wp-cron. Especially caching plugins. I’d disable all of those and try again. Make sure you’re site is using the right time zone under Settings > General. If you’re still having problems I’d guess a hosting issue. I am trying to schedule a sale on a variable product. How do I do that? You can do this just like you would adjust the price of a variable product. You go into the variation and schedule the sale price. Each variation can have different schedules and discount amounts. It’s not showing on product page. Why? There’s most likely something wrong with your theme. Or less likely another plugin that’s conflicting. Is there a way to link something to the sale dates? For example, if I want to add text via a custom field to go along with the sale and end when the sale ends? 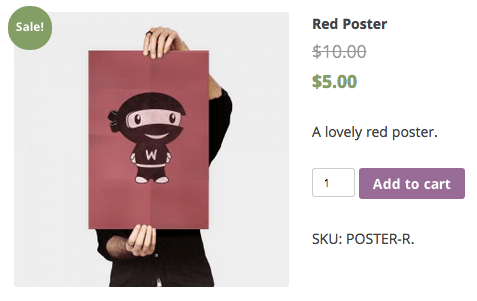 I know this could be done another way, but having it integrated into the woocommerce sale function would be great! Nothing like that built into WooCommerce core. You could certainly customize something to show up (a special field, some copy, etc) when there’s a sale going on. I’d reach out to Codeable for custom development work like this. If it’s just a field that you can add when a sale is going on I doubt it will be expensive. Question: How does this work with a subscription? If someone purchases a WooCommerce Subscription product inside of the sale date, the sale price should only apply to the first payment, correct? For instance, if I wanted to have a sale for a week on a recurring monthly subscription, I would only want that first payment to be the one that the sale price is applied to. Is this how it works? I’ve been having a hard time finding documentation on this. Thanks for your help! If I don’t set an end sate will the price change still work. I basically just want to permanently reduce the price after a certain date. I recently found out that an articles keeps on displaying the sales price after the scheduled sales end date has passed. Like, two days after the scheduled end date the sales price is still on the product. SImply editing the product and the clicking update will fix this issue but that of course defeats the purpose of a schedule. Do you have any idea how that this can happen? I read things about wp-cron? What is it? What can I do to test it? wp-cron seems to be a server side job that runs regularly? I read that sometimes plugins can break the wpcron. I have several plugins. If I deactivate the plugins, do I then have to wait for the wp-cron to run for the sales price to change? Or will I see immediately if the deactivated plugin has an effect on the wp-cron/sales price? Kinda stuck here… All plugins and software is updated to the latest version. Is it possible to set start and end date of a sale using the bulk edit function? I don’t think so. I’d recommend putting it on the WooThemes Ideas Board. is it possible to change the sale price date to sale price hours? I wanted my products to be for sale in only hours and not days.. This is possible but it would have to be custom. I would reach out to Codeable. Hi! Is there a way to pick the time? For example, I want to start at Friday, 2pm. How does WOO account time? It starts at the time I added the sale? Right now it only handles dates. It you need it to work at a certain time then I’d recommend Codeable. Do you know if there’s a way of doing this by brand so you don’t have to go into each product individually… it’s very time consuming! Hi Patrick, is there a way of filtering product by sale price, i’d like to group all products which have a sale price on one page, now i had added a sale category and added the product to it, but when a scheduled sale price ends i would have to edit each of the products manually, un-ticking the category? I have scheduled date from 25/11/2016 to 30/11/2016. But now is 30/11/2016 and there is no sale. It look that it works only to a day before. Not sure if you will see this. Are the dates set to midnight? I guess I am confused on end date. I want the sale to start at midnight on black friday and run just for that day. I am assuming the end date should be the saturday but I can’t find an answer to set this up correctly. The end date should be Saturday. Hi, Patrick how about if I want to schedule sale one day in a week ie sale on Thursday every month? Do I really have to go into each product and enter a sale price? Is there not a way to bulk action this? It’s so tedious to do this one by one. i have set start date and end date of sale. after end date schedule are reset and date are gone from meta-data so i can not figure out my which sale expired in this week. how can i stop removing date from database. I am trying to schedule date on product page. i have done complete your process yet is not showing on product page schedule date. I would like to set up a 24 hour sale offering 10% off everything. I followed your guide but can only do this one item at a time. How do I bulk action this ?